↑ (2008-10-07). "×Citrofortunella microcarpa (Bunge) Wijnands". Germplasm Resources Information Network. Accessed on 2011-05-05. ↑ Morton, J. (1987). "Calamondin". New Crop Resource Online Program. 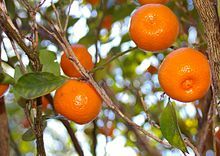 Calamondin - The Most Versartile Fruit at Aggie Horticulture. หน้านี้แก้ไขล่าสุดเมื่อวันที่ 23 กรกฎาคม 2561 เวลา 22:40 น.